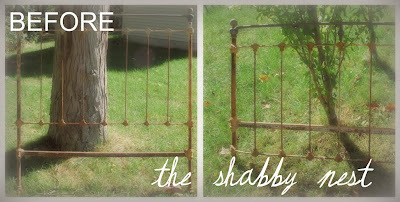 I just love breathing new life into something old and lovely that has been neglected. Case in point, this beautiful, antique, wrought iron bed. It has amazing details and a fabulous curved foot board that just makes me drool. It sat in my sister-in-law's barn for years because it didn't have any side rails. I asked her if I could have it, and try to bring it back to life, and she agreed, although she may have been a little skeptical that I would be able to do it. Finding the exact rails that would work with this bed would have been very time consuming, and probably very expensive. Luckily, I had a plan that involved my metal-working father. Between the two of us, we formulated a workable solution that involved a king-size metal bed frame, bolts, welding, and lot of muscle from my Pop. Thanks, Pop!! 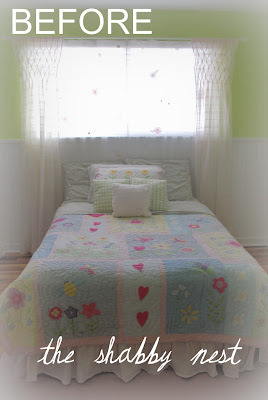 This is what the Princess' bedroom looked like after I had finished her smocked curtains, but before the bedframe was rehabbed. Pretty, but lacking a certain something. After my father finished rigging the frame, I gave the head and foot board a fresh coat of paint. Now this beautiful bed stands proud as a testament to what a little love and a lot of ingenuity can do. It is the crown jewel of my daughter's bedroom. 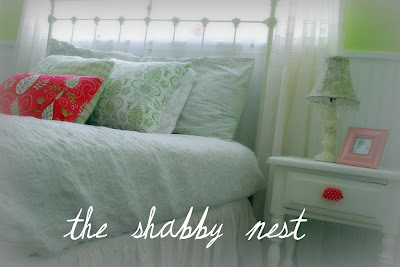 I dressed the bed in a vintage-inspired matelasse coverlet, the palest pink bed skirt, and a pile of scrumptious pillows. And because my daughter is a 7-year-old with modern sensibilities, I decided to add some funky new fabrics in addition to the soft, vintage-look floral, and the chubby chenille. A damask-inspired print in a lime green and the same pattern in a hot pink colorway really add punch and playfulness to the pretty old bed. I also added the wonderful fabric decal Spring Dress Up Doll from Love Mae. I have recommended these beautiful decals to some of my Design Consultation clients because obviously they are darling, but they really are reusable! The princess constantly changes her doll's outfit and the decals look as great as the day we got them. They also add a touch of "mod" to this vintage-y room. A closeup of the pillows, so you can see the fabulous fabrics!! Here is a before of the nightstand I used in the room. 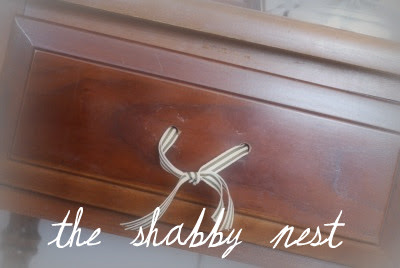 You can read about how I got the idea to use ribbons for a drawer pull here. I rehabbed it with a fresh coat of white paint and switched the brown and white striped ribbon for one in hot pink polka dot. Coupled with the bed, it makes a pretty vignette and is a nice place to put the pretty little vintage lamp that I also rehabbed with a few coats of spraypaint. You can read about that redo here. Finally, to bring a little color to the foot of the bed, I secured a green and pink berry wreath to the center post with another bit of polka dot ribbon. And everything old is new again! Gorgeous bed, Wendy! So glad you were able to come up with a solution to give a new life to it. I'm sure your daughter will get good use out of it for many years to come! Your bed is beautiful! What a great job to make that work. I also love the pillows and wreath hung at the end. The bedrooms you create are amazing, a wonderful, inviting, relaxing, beautiful place. Love the frame. And the touches you add, beautiful. BEAUTIFUL room! The headboard is absolutely stunning. I love the curve in the footboard area. Wow. The entire room, pillows, all of it is simply perfect. Nice entry, Wendy! Absolutely adorable, all of it, great job! 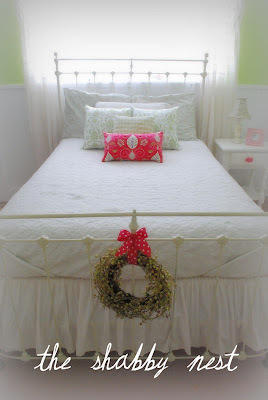 Really pretty bed and I love the wreath on the footboard! Wendy, that fabric on the bright pink/red pillow is fantastic. Beautiful use of an old bed! Perfect harmony of colors!! Soft, but so very sweet! I think this is a truly beautiful room! Well done. *sigh* So beautiful! Well done! It's so charming and I love the pop of the green walls! 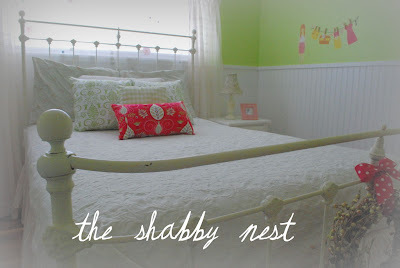 Wendy your daughter's room is just gorgeous. 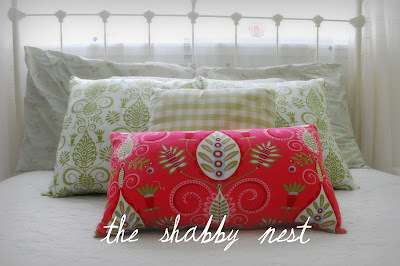 Love the whimsy touch with the fabrics.... that pop of color is so happy!! Old to new is always soooo much fun!!! great job and happy Monday!! It is definitely the crown jewel of the room! Beautiful! It's so pretty! I knew you could do it! :) Great job - what a lucky little princess! The bed is the "icing on the cake". Good team work with you and your dad! Hi Wendy thanks for stopping by my blog...I thought I would visit you too!! I like you ribbons on the drawers...too bad they won't work on a dresser I have (I think the drawers would be too heavy!!) but I will have to remember that for furture projects!! Sweet room....wish it was in my house! Oh Wendy, It's GORGEOUS! Truly fit for a princess. Love the wreath! I am headed over to vote now! It is so sweet I love it. I adore wreaths at the foot of beds and at Christmas you can do stockings so sweet!! I also love ribbon draw pulls. Such an amazing room ! This is beautiful! I especially love the two pops of red! !